Bill Gates, Mark Zuckerberg, Albert Einstein, Michael Jordan, Ghandi, Abraham Lincoln, Warren Buffett and Larry Page. 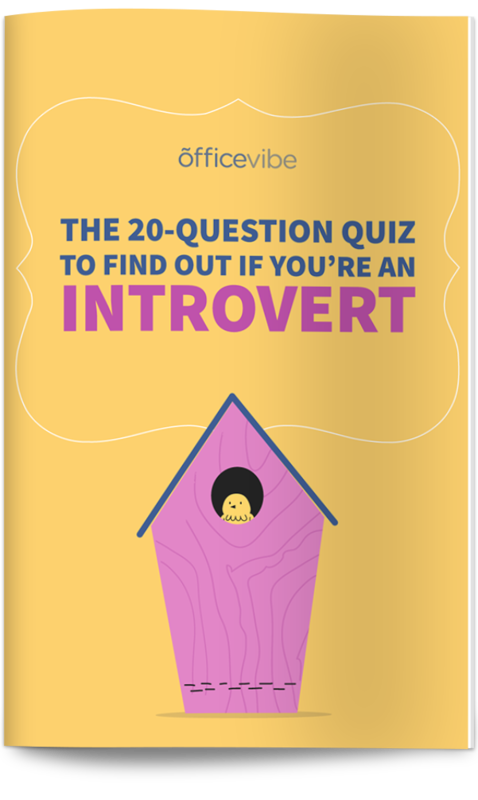 Download this questionnaire to find out where you fall on the introvert-extrovert scale, and what type of leader you are. We typically attribute extroverted features like outgoing, bold, dynamic and authoritative to someone in a leadership role, but the truth is that these are not the only traits that make for a good leader. Just like pizza can be delicious with all different combinations of toppings, good leadership works with all different sorts of personalities. It just depends on who the audience is. Introverts are introspective, not isolating. Introverts don’t necessarily have less to say than extroverts, we just don’t speak as often. Introversion does not equate with shyness, however we are often greater fans of the one-on-one convo than the group chit chat. Introverts enjoy observing social settings, but this does not mean we’re scared of them, or judging. Different types of leaders will succeed in different situations, depending on the group. Much like some plants grow best in sunlight, and others do better in the shade. One is not more of a plant than the other, they just flourish in different settings. Pairing extroverted leaders with employees who take initiative and speak out can lead to friction, while pairing the same group of employees with an introverted leader can be a pathway to success. Essentially, it’s an inverse relationship. Passive groups do well with extroverted leaders and proactive groups do well with introverted ones. Why Does This Formula Work Best? In an interview with Susan Cain, author of Quiet: The Power Of Introverts In A World That Can’t Stop Talking, she explains that quiet leaders work well with an outgoing team because they are more likely to let their employees actually run with their proactive ideas. Imagine a room of extroverts shouting out ideas, in it for the win, excitable, loud, and outwardly confident, ra ra ra ?! How does a leader with the same traits help navigate this? Now imagine a room of introverts, pensive, thoughtful and observant with a likewise introverted manager. Who is going to get things moving, pull ideas out, enthuse the team? As the old saying goes, “opposites attract”. 50% of the US workforce self-identifies as introverts. 64% of workers believe their organisation doesn’t fully harness talents of introverted employees. 96% of managers self-identify as extroverts. Leadership teams are often imbalanced and don’t fairly represent a diverse workforce. Recruitment teams need to consider this and do an audit of their team before deciding who is going to lead it. Remember, some plants need sun, others need shade. Make sure you get the right type of plant for your specific environment. If you think about it, we live in such a fast-paced world that sometimes ‘real’ listening doesn’t seem to fit into the day-to-day grind. We half listen and half get ready to say what’s on the tip of our tongue, focusing what we get out of the conversation instead of the conversation itself. Outgoing people tend to do a lot of the talking, but part of leadership isn’t only leading with your own words, it’s listening to what others have to say. Introverts are more attentive ,and are more likely to listen to, process and even implement other’s ideas than extroverted leaders. Extroverts are more likely to take chances and have a “let’s go for it!” attitude, which in many instances is great. But, on the other hand, introverts tend to examine situations with a bit more circumspection, ask more questions, dig a little deeper and think a little longer. They’re more cautious. They spend a lot more time preparing than actually doing, so their decision-making process is typically trusty and well thought out. Introverts are in touch with their emotions, which allows them to have a great deal of empathy for the people around them. Simon Sinek explains that empathy is the most important tool for a leader to have in his toolbox. Without [emotional intelligence], a person can have the best training in the world, an incisive, analytical mind, and an endless supply of smart ideas, but he still won’t make a great leader. Introverts are hyper-aware of their surroundings. They might spend more of their time observing than participating, but this isn’t necessarily a bad thing, and it only means that they aren’t participating externally. What’s going on internally is a whole other story. Introverted leaders may be quieter, but the flip side is that they are often more reflective and critical of situations. They are focus-ninjas, and not just on what is plain to the eye, but what lies beneath. They pick up nonverbal cues and understand things that aren’t even there; the meaning of the white space. This perception is extremely valuable as a manager. Have you ever heard of the term servant leader? Basically, it implies that instead of employees serving their bosses needs, the bosses serve their employees needs. It goes against the grain of the hierarchy we typically attribute to work relationships, but it’s a nice concept. Ultimately, we would say that both need to serve each other in a sort of mutual-respect-driven relationship. Servant leaders educate the members of their team through their words and actions, and they encourage their people to set aside self-serving behaviors in favour of serving others. Introverts fit under this umbrella because of their lack of interest in the limelight. Instead, they shine the light on others. They become mentors and guides, serving their team to reach their greatest potential, which then serves the success of the company. This takes humility. Keeping all this in mind, it’s really important to note that not everyone is only an introvert or only an extrovert. There’s a spectrum, and often people can possess bits of both qualities. And, one is not better than the other! The workplace needs both types of leaders. Take this quick quiz to find out where you fall on the introvert-extrovert spectrum. Are you an introverted manager?